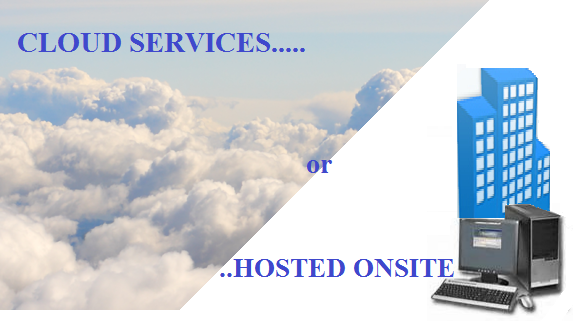 Flexible quoting options that will fit any budget! 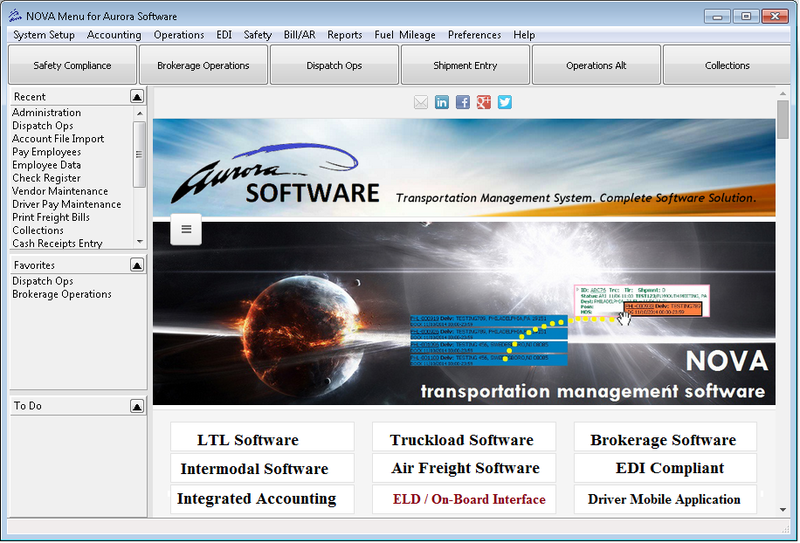 Aurora Software is proud to offer you NOVA, our complete Trucking Software Solutions! NOVA utilizes the latest in transportation technology allowing your company to run smooth and efficient. We handle every aspect of your company's needs from dispatch operations, invoicing, ELD / on-board device integration, integrated accounting, driver settlements, automatic rating, driver mobile app, integrated imaging, driver safety, and the list goes on! Aurora Software Reviews Recently Reviewed! Interaction with driver applications - engages drivers and allows simplified updates from driver that are captured immediately into the software, including document images. Cons: There is nothing that I currently do not like. The biggest challenge for me in this installation has been wrapping my mind around the simplified structure. Coming from the package we are currently using, I am constantly looking for duplication of data, 'work-arounds' for items that cannot be solved, etc. -- So far nothing has come up that Aurora has not been able to address. Overall: My overall experience with Aurora Software has been outstanding. Our company has many facets. We are a LTL consolidator with in house warehousing, LTL logistics company, and a TL logistics company with a brokerage division. We looked at many packages before making our changeover and none of the others we reviewed could handle all of our multiple functions. Aurora software has benefited us by giving visibility to our dock operations, as well as our, dispatch and back office functions. Pros: Simple and easy to use. From customer service, Dispatching, billing, and accounting. Everything you need on one platform. It helps keep my team on the same page as the information about our accounts is available to everyone. Cons: Its hard to answer, any time that we have asked for a simpler way to do any process, Aurora has found a way to modify and make our ideas part of their system. You cant knock a system that works with you and for you. Overall: From the Sales team, to their support staff, you can count on them to solve any issue that might come up. 99% of the time we find its something that one of our staff did wrong, yet they are always willing to help figure it out and train the staff person to make sure they completely understand how the system works. If you in the market for a new system, you have to give Aurora Software a look. Pros: I love the variety of features in the software. I'm still learning how much I'm able to do with it. It is easy to navigate and keep up with our customers and their freight. Cons: Occasionally we have a problem with locating some information that we need, but customer service is amazing and helps us with any problem we face. Overall: Aurora has outstanding customer service. During our transition to new software, they have gone above and beyond to be sure we have everything we need to keep our business running smoothly. Pros: Aurora Software is tried and proven. Their management team and programmers have years of experience in the transportation industry. Aurora's customer service department is always friendly and helpful. Cons: We use an internet version of Aurora's software. Sometimes it drags due to high internet volumes. Overall: Our experience with Aurora has been positive. Simply put, their software allows to trace, track, rate and invoice shipments correctly and efficiently. Pros: Each program is easy to use. Each step is easy to follow. Overall: Having an easy software to deal with is very helpful to new hires that are not familiar with the system. Pros: I appreciate the continuity of Aurora software. Once we have it completely implemented, it will help with office efficiency and a much-improved workflow. Aurora is user friendly and easy to navigate. Cons: I knew the transition from our old software to new software would be time-consuming. This is the only issue I am having, however that has nothing to do with the software. Overall: The customer service at Aurora is excellent. Overall: I have worked with the Aurora Software team off and on for almost 30 years. They are an amazing group of people that know the business and take pride in what they do. Always there to help and go above and beyond. The programmers are awesome! Whatever your programming needs...they will do it. Pros: It is very robust and functional. The billing process follows closely with the structure of the transaction source documents making the process more reliable and trainable. Cons: A few of the older, less utilized modules and functions need upgraded. Overall: They are terrific to work with, very friendly and helpful. They have always been able to solve any problem I've had quickly and efficiently. Great people! Great all in one System. Pros: After switching to Aurora software we have better communication throughout the office. Reason being everyone has access to information such as credit and volumes for each customer. Their reporting features are outstanding. Everything is in one system . Cons: I have nothing bad to say. All my experiences with this program have been positive. Pros: The product is very easy to use and the customer support is 2nd to none. Many of the companies that we deal with use Aurora as well. 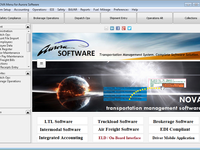 Overall: We have used Aurora Software for 18 years. 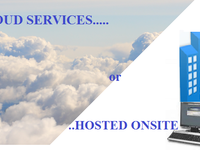 They have made our billing and and dispatch process more streamlined. Anytime we have a issue they are ready to step in help solve the issue. Pros: I like how efficient the software is, according to my needs. Easy to manage and quick to provide what I need. Cons: An online manual that is descriptive about all aspects of the software would be helpful. Overall: Excellent customer service, always willing to help and quick to get back to me! Great product that is user friendly. Pros: We have always had an easy time using this software at our Company. If we ever have a problem, representative and the rest of the staff at Aurora are quick to solve our problems for us. Cons: We really have not had any issues that we don't like!!! Overall: This system works very well for our Company!!! Pros: The architecture is streamlined and efficient. Aurora has a knack for making complex scenarios much more simple and easy to follow. Cons: At this point, we don't really have any issues. When things come up, our Aurora support is able to work through the issue or at times create mods. Overall: Overall, we have been extremely happy with the software, and equally important, the support. From our designated Aurora contacts to their help desk, everyone has been more than helpful. Pros: The software is very easy learn and use. Overall: For over 25 yrs. Aurora Software has been wonderful. Their responsiveness, capabilities, and willingness to go above and beyond has been fantastic. Aurora, the software company you should be using!! Pros: Easy to use, and the I.T. support is always available to help! Cons: I would have liked a search box for the subject line. Overall: In nearly 6 years, we never had a problem they could not resolve over the phone in a timely fashion. Pros: Amazing driver settlement features and Colour coded alerts and updates.The imaging and notifications are remarkable. Cons: I did not find any features that I can comment on or that I disliked.My only comment is that better enhancement can be made to the logon process i.e. to be simpler. Overall: Accurate and configurable Driver Settlement options . Pros: Very easy to learn and navigate the system. Overall: They are a great group of people to work with.